The Philippines’ job satisfaction level dropped from 5.25 in 2016 to its current rating of 4.97 on a 10-point scale. 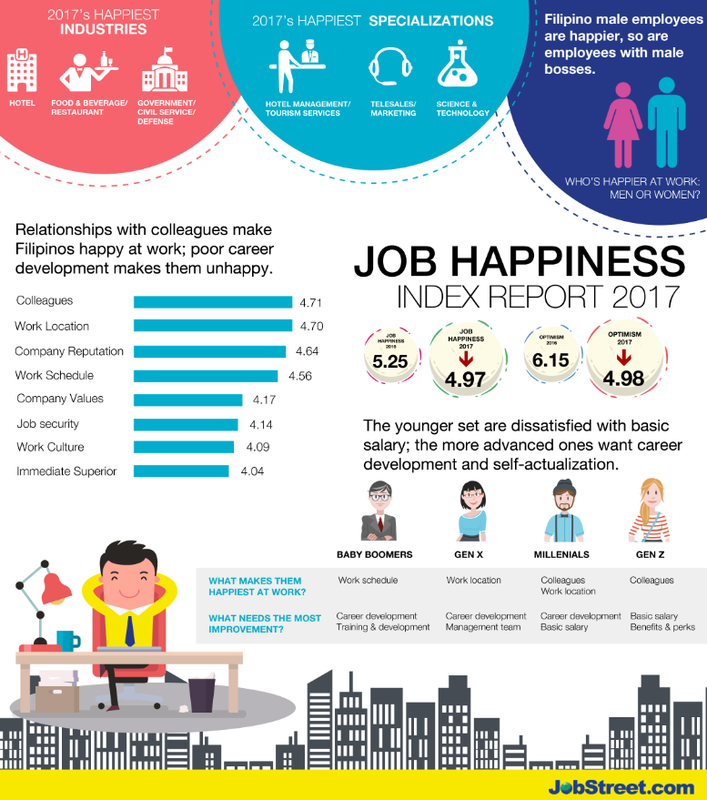 This is a significant change since Filipinos were deemed the happiest workers compared to their counterparts from six other Asian countries based on JobStreet.com’s 2015-2016 Happiness Index Report. The latest Job Happiness Index idientified lack of career development and training opportunities, as well as the management style of a company’s leadership team, as the key factors associated with unhappiness at work. When respondents were asked what will make them happier in the next six months, 33% said a salary increase would help, but 23% wish to resign and get a new job. Colleagues and work location make Filipinos happy at work The respondents who said they were happy cited colleagues, work location, and company reputation as the top three drivers of workplace satisfaction. This is largely true across all demographics. Generation Xers barely managed to score above neutral at 5, while millennials, who compose the majority of workplaces, are below neutral with an average of 4.9. “The results of this study serve as a wake-up call for companies who wonder why there is such a high turnover rate. Career development, training opportunities, and the management style of the company’s leadership team are just some of the reasons why many Filipinos are unhappy in the workplace. It would be best if managers can get to the heart of why this is happening as each company’s DNA is unique,” Gioca added. Visit jobstreet.com.ph for more information about JobStreet.com and the 2017 Job Happiness Index.